Washington (AFP) – North Korea’s attempted test of what appeared to be a medium-range missile suffered a catastrophic failure, a Pentagon spokesman confirmed Friday. “I can tell you it was a fiery, catastrophic attempt at a launch that was not successful,” Navy Captain Jeff Davis told reporters, adding that the US military was still assessing exactly what happened. He added that the missile was likely “road-mobile” — or transportable — because it had been launched from an area on the east coast of North Korea where tests don’t normally occur. 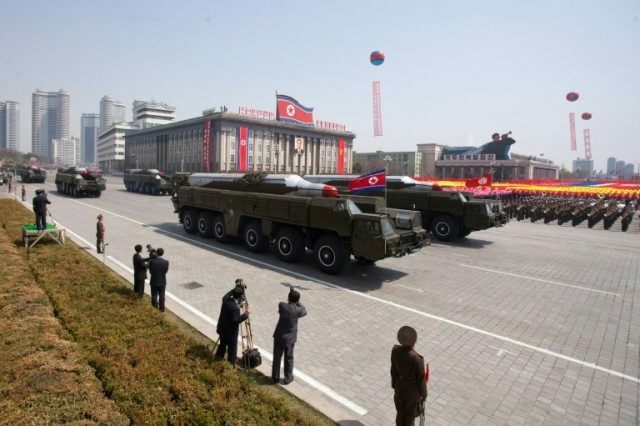 Recent intelligence reports suggested North Korea was preparing for the first-ever flight test of its Musudan missile, which is believed to be capable of striking US bases on the Pacific island of Guam. “It’s why we have invested so much in our ballistic missile defense system,” he said. A US defense official has said the missile was “presumably” a Musudan. A Seoul intelligence official quoted by Yonhap news agency said the missile disappeared from surveillance radar a few seconds after its launch early Friday and is believed to have exploded midair. Davis said the latest launch attempt would surely factor into conversations between Washington and Seoul about the deployment to South Korea of the sophisticated THAAD system — Theater High Altitude Area Defense System. “This is something that’s being done because of North Korea’s continued provocations,” he said.